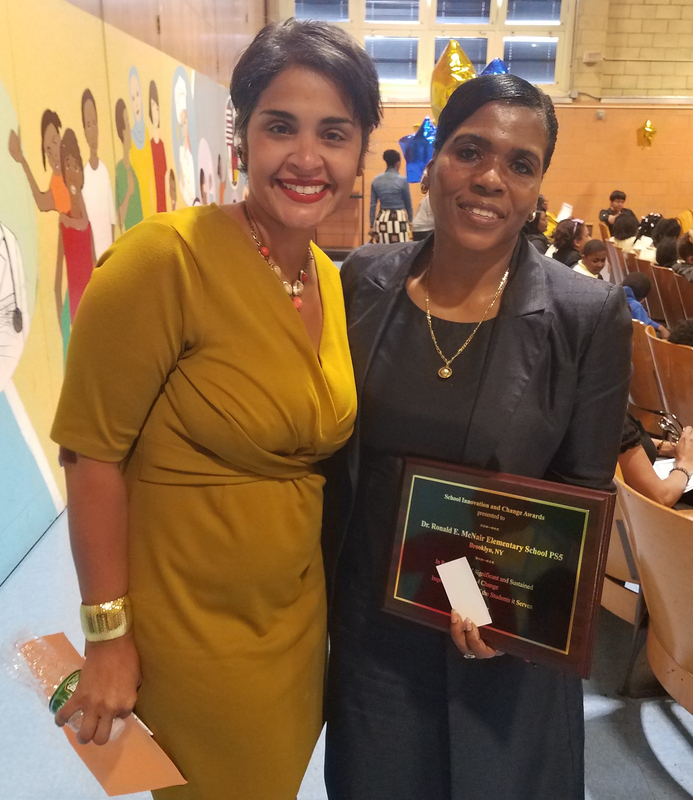 The National Principal Leadership Institute recently presented Dr. Ronald E. McNair Public School 5 with its 2017 School Innovation and Change Award (SICA). “I am tremendously excited about this award today because it is going to a school that is a model of what this award is all about,” shared Dr. Lew Smith. “[Dr. Ronald E. McNair] proved what can be done. He proved it in his own life and the school named after him is proving it as well.” The prestigious award is given annually to recognize schools that rose from underperforming to exemplary. In the 18 years that the award has been in existence over 950 schools from across the 48 states have been awarded. This year, PS5 was 1 of 4 schools to receive the special honor. The student-led ceremony took place in the school auditorium. It opened with a warm welcome by Ivan DeJesus. Fourth-grade student Ramona Sealy took on the challenge of introducing Dr. Lew Smith and providing the history of the award. Her introduction was proceeded by a formal reading from Adelaide Sanford Oratory Contest participant Cheyenne Walker entitled, “In Honor of Teachers” by Charles Blow. 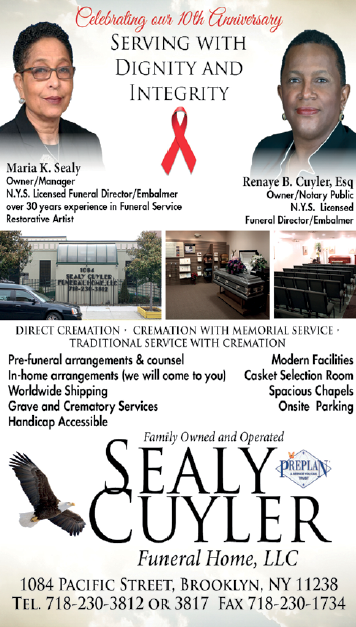 New York State Senator Velmanette Montgomery was unable to attend. However, she arranged for Community Liaison Jason Salmon to present a proclamation. The honor was followed by a performance by PS5 Dance/Theater Troupe choreographed by dance instructor Chris Cooper and directed by instructor Waliek Crandall. District Superintendent Rahesha Amon was present. She shared with the audience how “committed Principal Gates is to all her students”. Brooklyn Deputy Borough President Diana Reyna concluded with an exciting announcement that PS5 was selected as one of the schools to receive STEM Education and Technology capital funding of $800K. Attending community leaders included Community Board 3 District Leader Henry Butler, Community Board 3 Chair Richard Flateau, Drs. Renee & Lester Young, Amalgamated Bank’s Andrea Magnus-Thorpe, Material for the Arts Director of Education John Cloud Kaiser and community organizer Melissa Plowden-Norman. Immediately following the presentation, guests were invited to attend a luncheon where NYC Office of the Mayor, Brooklyn Borough Director Tahirah A. Moore presented Principal Gates with a personalized letter of citation from Mayor de Blasio. “I am proud to join in applauding the ways this vibrant academic community is working towards a brighter future in giving young New Yorkers a gift of education to receive their fullest potential,” stated the citation. Four years ago PS5, under the leadership of Principal Lena Gates and Assistant Principal Kesha Townsel, set out on a journey to improve the school’s test scores and provide a congenial learning environment for its students and teachers. With a dedicated staff of educators, committed parents and staff the school joined forces with various community organizations in providing a variety of experiential learning services to its students. This includes the Adelaide Sanford Learning Center that provides peer educational tutoring, a campus book store where students exchange their own McNair Buck currency, dance classes and instructions, a new music program, financial literacy workshops and much more. Next articlePS 25 Welcomes Spring!